"Quick and easy way to fix up gator bites for your friends - exotic, but taste like chicken! You can get frozen alligator meat online." Place alligator meat in a medium bowl, and mix with vinegar, salt, and pepper. Cover, and refrigerate about 10 minutes. Pour oil into a large skillet to a depth of 1 inch, and heat over a medium-high flame. Add to a large resealable bag the flour, cornmeal, garlic powder, cayenne pepper, and black pepper. Squeeze off excess liquid from meat, and add one handful of meat to the resealable bag. Shake to coat. Remove meat, shake off excess flour, and set on a plate. Repeat with remaining meat. When oil is hot, place meat pieces into oil, being careful not to overcrowd. Fry until golden brown, about 3 minutes. Remove to paper towels, and serve hot. To prepare dipping sauce, mix together in a small bowl the mayonnaise, horseradish, brown mustard, and red wine vinegar. This is a true southern recipe. I usually do dip mine in buttermilk prior to flouring but I tried it with the vinegar this time and it was good. This was great. Will definatly be making again. 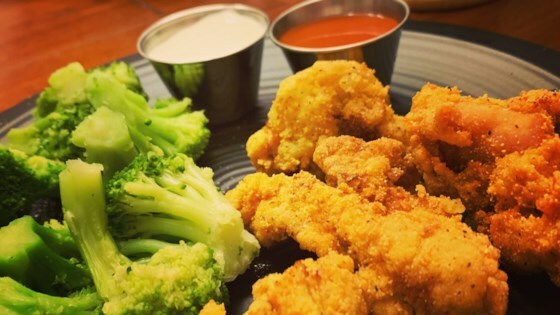 Good basic recipe for alligator fingers.I use Frank's Red Hot sauce mixed in with the vinegar to marinate. Awesome! I dipped these in my own horseradish dip and it was amazing!